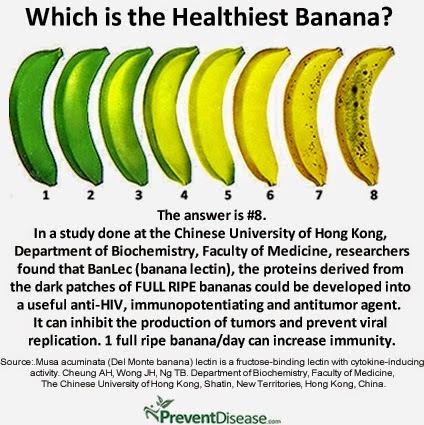 According to Japanese Scientific , full ripe banana with dark patches on yellow skin produces a substance called TNF (Tumor Necrosis Factor) which has the ability to combat abnormal cells. 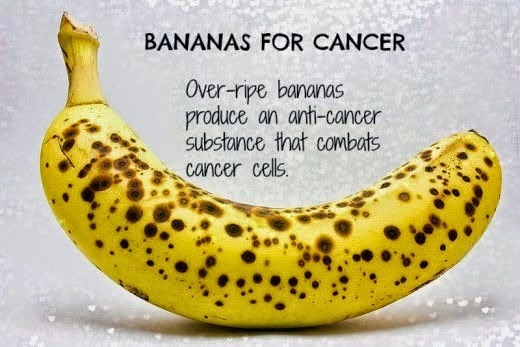 The more darker patches it has the higher will be its immunity enhancement quality; Hence, the riper the banana the better the anti-cancer quality. Yellow skin banana with dark spots on it is 8x more effective in enhancing the property of white than green skin version. Eating 1-2 banana/s a day increases immunity. It is a fact that nutrient content of fruits change slightly as they ripen. As a banana ripens and turns yellow, its levels of antioxidants increases. These antioxidants in ripe bananas protect your body against cancer and heart diseases. But while overripe bananas certainly have nutritional value, they also lose some benefits. In full ripe bananas with dark spots on skin, the starch content changes to simple sugars that are easier to digest and may raise your blood glucose levels quickly, but it could be harmful for people with diabetes. Also, the micronutrients like vitamins and minerals decrease as the bananas ripen. Tumor Necrosis Factor(TNF-α) is a cytokine, substances secreted by certain cells of the immune system that have an effect on other cells. This is indeed helpful in fighting abnormal turmor cells in body. Research done on ripening bananas has proved that the levels of TNF-α induction increased markedly with dark spots on skin before the entire banana peel turned brown. The research concluded that the activity of banana was comparable to that of Lentinan, a chemical immunostimulant that is intravenously administered as an anti-cancer agent. So, ripe banana can act as an anti-cancer agent by stimulating the production of white blood cells in the human cell line. Both green and yellow bananas are rich in potassium, vitamin B6, fiber, and vitamin C. They have high calorific value because of their high sugar levels. A medium sized banana provides about 105 calories. Also, bananas are very good for our Gastro-Intestinal tract and aid in digestion. Therefore, eating one or two bananas is indeed good for health. Once bananas ripen fully, store them in the refrigerator to minimize further vitamin loss. Fresh bananas with brown patches on the skin are ripe enough to eat immediately. Make sure to avoid over-ripe bananas whose skin has turned brown or split open. And yes, you can share this healthy information with everyone.